This is the only surviving letter written by Henry VIII’s fifth wife. 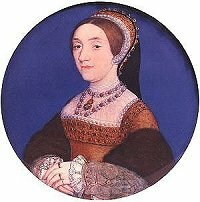 It was written in the spring of 1541, roughly eight months after she married the king. After Catherine’s fall from grace, Culpeper was among the men charged with committing adultery with the queen. It was a treasonable offense, and he was executed for it (along with Francis Dereham.) Culpeper tried to save himself by arguing that he had met with Catherine only because the young queen was ‘dying of love for him’, and would not let him end the relationship. The affection she felt for Culpeper led to a legend surrounding Catherine’s last words – ‘I die a Queen, but would rather die the wife of Culpeper.’ This final declaration of love did not occur; its invention was an attempt to give Catherine’s pathetic and tragic story some mark of distinction. Catherine was not as well educated as Henry’s other wives, though her mere ability to read and write was impressive enough for the time. This letter taxed her greatly, as she points out in the closing lines. It is transcribed here as originally written, and the grammatical mistakes are Catherine’s own.